Invest in the future of your girl-child. Most in demand & high paying jobs today are Science & Tech based but mainly dominated by the males. Girls can be prepared ahead for this as well. 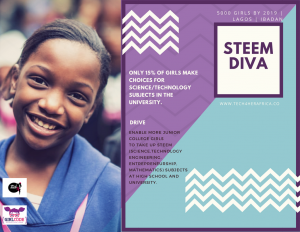 STEEM Diva is a program designed for junior college girls (JSS1-JSS3) in Ibadan to inspire them to choose STEEM (science,technology, engineering, mathematics subjects as part of their post secondary goals. We are hosting pilot series in preparation for our main event this August. * Digital Literacy: How to search google, Using Gmail, Using Microsoft Office. * Training from top experts in the industry. * Chance to get scholarship to study at senior class & the university. * STEEM Diva Ambassadors: We are grooming the next female generation leaders. * Participate in exchange programs abroad.